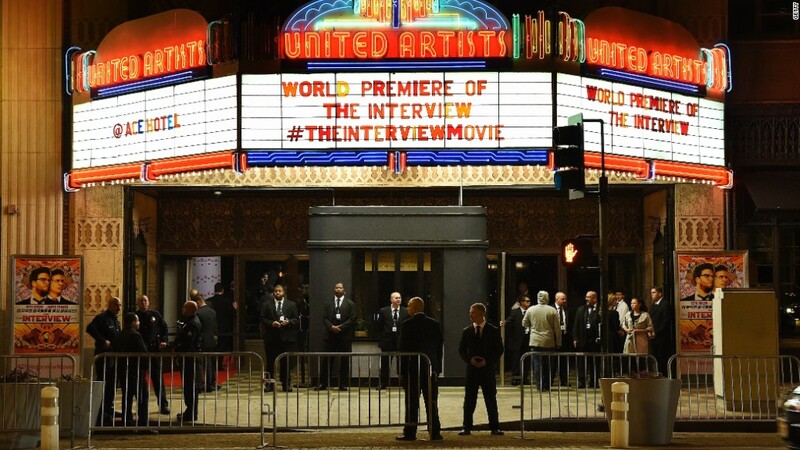 Wednesday morning update: our newest story about "The Interview" release is over here. Original Tuesday story: "The Interview" is not over, after all. Despite threats from hackers, Sony (SNE) Pictures is making the controversial Seth Rogen comedy available at a limited number of theaters starting on Christmas. The movie studio's CEO, Michael Lynton, said Tuesday afternoon that "while we hope this is only the first step of the film's release, we are proud to make it available to the public and to have stood up to those who attempted to suppress free speech." By Tuesday evening, more than 200 independently-owned theaters had agreed to show the film. More might still get on board: one Sony source said the studio is "still counting" the total number, and that it could end up "around 300." None of the big theater chains, like AMC or Regal, have said they'll support the Christmas release yet. Those chains could choose to show "The Interview" in the coming weeks, but some of them are objecting to Sony's plans to make the movie available through a video-on-demand or streaming video service. Lynton hinted at that possibility in his statement, saying, "We are continuing our efforts to secure more platforms and more theaters so that this movie reaches the largest possible audience." No companies have publicly agreed to help Sony stream the movie online, and discussions were still ongoing on Tuesday night. A streaming deal may be announced on Wednesday, another person close to Sony said. The independent theater release plan comes almost a week after Sony originally canceled the Christmas release of "The Interview" in up to 3,000 theaters. Backlash to the decision was fierce, including from President Obama, who said the movie studio had made a mistake. On Tuesday, a White House spokesman said "the president applauds Sony's decision to authorize screenings of the film." "As the president made clear, we're a country that believes in free speech and the right of artistic expression," the spokesman added. In light of concerns about security at theaters, an FBI official said "we are fully engaged with Sony on the decision" to release the movie. The owner of one independent theater said he had no concerns about security. "If we thought that this was a danger to our audience, we wouldn't show the film," Paul Brown, owner of the Terrace Theater in Charleston, South Carolina, told CNN's Brooke Baldwin. Brown said he saw financial upside for his theater thanks to all the public interest. A few minutes after the studio chief's statement, Rogen tweeted: "The people have spoken! Freedom has prevailed! Sony didn't give up! 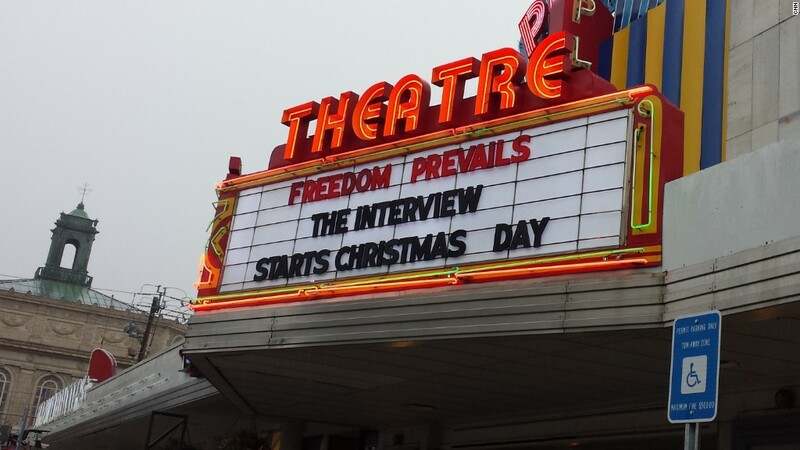 The Interview will be shown at theaters willing to play it on Xmas day!" On Instagram, co-star James Franco called it a "victory" and said "the people and the president have spoken." "The Interview" is about an assassination plot against the North Korean dictator Kim Jong-Un. It is widely believed that Sony Pictures suffered a cyberattack last month partly due to North Korea's fury over the movie. Sony, for its part, says it had little choice but to cancel the release last week after major theater chains like AMC and Regal backed out of plans to put it on their screens, citing threats from the same anonymous hackers that had apparently hacked into Sony. There was an immediate backlash to the cancellation of the film. The same day President Obama, said Sony had "made a mistake," the studio started looking for new ways to distribute the film in some fashion. With each passing day, more people -- including writers, independent theater owners and members of Congress -- spoke out. A petition titled "We the undersigned support Sony" started to pick up steam on Monday on the web site Change.org. It was published by Art House Convergence, an association of independent theaters across the country. Some of those same theaters are now on board for the limited release on Christmas. One of the members of the association, Alamo Drafthouse CEO Tim League, said in a statement that "this is the best Christmas gift anyone could give us." He added, "We, both distributors and exhibitors, have collectively stood firm to our principles and for the right to freedom of expression. Two days til Christmas, and I am proud to be an American." Michael Furlinger, the president of the Plaza Theater in Atlanta, said he received an email at about 11 p.m. Monday saying a Christmas release was in the works. He initially thought it was a prank -- or even possibly another hack. But a followup phone call confirmed its legitimacy. On Tuesday afternoon, this building's marquee was changed to say "Freedom prevails!" Asked by CNN's Suzanne Malveaux if people are skittish about seeing the movie, Furlinger said "half of 1 percent are skittish and the rest seem very enthusiastic." "I think it's almost that they want to do their civic duty to come see this picture, because it's about never having censorship when it comes to films, books," he said. Before Sony's announcement on Tuesday, that same sentiment had been widespread on social media among people who wanted to see the movie in order to make a statement. A growing number of organizations and politicians had offered to hold free screenings. On Monday, Congressman Brad Sherman, a Democrat from California, told Sony he wants to hold a screening on Capitol Hill. According to a new CNN/ORC poll, conducted December 18 through 21 and released on Tuesday, 36% of Americans think Sony made the right decision by canceling the movie last week, while 62% thought it was an overreaction. Men were about 20 percentage points more likely than women to call it an overreaction. --Pamela Brown contributed reporting from Washington, Michelle Kosinski from Honolulu, Hawaii, Stephanie Gallman from Atlanta, Lorenza Brascia from Los Angeles, and Brooke Baldwin, Lindsay Perna, Molly Shiels, and Gregory Wallace from New York.